If you are a roleplayer, or a gaming historian, or a fan of D&D, you have to read this book. That simple. I don't say that lightly. In fact, the word "lightly" does not apply at all to this volume. It is a massive tome, two and half pounds of paper, exhaustive in its documentation, delving so deep into the weeds that even the author at points mentions that you might want to browse some sections and come back later with a native guide and a machete. It is a text that, having spent the past 9 months reading it, primarily because of its lack of portability, I enthusiastically endorse for the Kindle. It is the history of roleplaying, from the dawn of time to about fifteen minutes before I showed up for my first GenCon. And it is detailed. Deeply so. This is no memoir of old gaming groups, or paeans to favorite games, or interviews with people twenty after the fact, after age and retellings had rounded the memories to smooth surfaces and convenient conclusion. Peterson uses primary sources of the age, digging through all manner of fanzines and communiques and promotional material to sculpt a reasonable and rational picture of how, through the confluence of a number of talented individuals and different fandoms, Dungeons & Dragons was launched upon the world, and what happened next. The book is broken down (after an introduction discussing his methodology), into five major sections, the first and the last probably the easiest for readers to swallow, as it deals directly with the historical progress of D&D. The opening section tells the tales of the wargamers of the sixties and the seventies, the fertile soil into which D&D, through the Chainmail fantasy supplement, was first seeded. Here is the Castle and Crusade Society and the International Federation of Wargamers, the first GenCons and FitS, the Dungeon boardgame and the Blackmoor Gazette. It leads up to the spring of 1974 and the publication of three small books in a woodgrain box at the then-outrageous price of ten dollars - Dungeons & Dragons. The next three sections break down the various components that contributed to the uniqueness and popularity of the game. First the fantasy setting, taking us on a tour through the pulps and weird tales and Tolkien, who was not a foundational author for Gygax, but whose popularity made the game easily understandable, and in reviewing this rich past puzzles out the various classes, monsters, and alignments of the game. 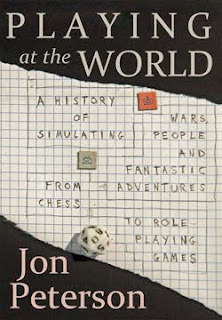 Then an analysis of rules, looking at the history of wargames, from German Princes to HG Wells (who I knew about) and Robert Lewis Stevenson (who I did not), and detailing the history of taking and resisting damage. In the final part of this exhaustive middle bit, Peterson deals with the question of immersion, and includes the SCA, role-playing within postal games, the Rommel Syndrome among wargamers, and the almost-was of the original Midgard campaigns. In the fifth section, all the deep history in place, Mr. Peterson rejoins the narrative of the creation of D&D with its rise to popularity, it conquering of the wargaming field as well as the influence of the science fiction and fantasy community of Southern California. Here appears Lee Gold's excellent Alarums & Excursions, and the schisms between early adopters. And here also appear the challenges that continue to this day - how to deal with others contributing their own creations? How do you maintain canon without sacrificing control? Lastly, Peterson concludes with a short section that starts with the Satanic Panic of the late seventies and its concern of overwhelming character immersion, and then taking up the computer development of D&D style games, which seeks to create that very sense of other-worldly immersion. This is a magnum opus, a great book, and one that should be on any respectable gamer's shelves (or in his Kindle). Peterson offers a concise and cogent definition of roleplaying ("A game in which anything may be attempted"), and, without taking sides, clearly defines the roles of the two founders in creation of the game (the short version is that without each other, there would be no D&D - Gygax was the ultimate collaborator while Arneson had the core concepts). And here's the thing - I'm not in this book. This is before I showed up on the scene. I'm off to side, growing up and playing Diplomacy in Pittsburgh and learning Avalon Hill games before going to Purdue. My first GenCon was at Parkside, which gets a passing mention at the very end of the Epilogue. I not part of the story yet, nor are a lot of the people of my generation of gamers - Steve Winter and Tracy Hickman and Doug Niles. We came on the scene later, after much of the dust had settled and by which time certain things were just not talked about. Fellow former WotCite John Rateliff IS there, but because of his OWN magnum opus, The History of the Hobbit, which Peterson uses when examining the Tolkien/D&D connection. This is a major historical work, which sets the definitions and discussions for years to come. It is the serious analysis of the history of roleplaying and how all the parts came together. I don't agree with all within, and there are parts where I actually think he needed to talk MORE about, but there are also parts that showed what was happening when I was still growing into this industry. This is very much. "How I Met Your D&D". Go get it, and make time to read it.